This traditional sweetened coffee is a wonderful treat after a night of "Posadas," the Mexican and Latin traditional celebration of the Christmas season. This religious and cultural event was introduced to the new world by missionaries as visconcillas and took on its on style in the new world. The Posadas has been traditionally celebrated on Olvera Street since 1930. In Spanish Posada means Inn or shelter. Thus the journey of Joseph and Mary to Bethlehem is depicted from December 16th through Christmas Eve in a candlelight procession led by the Olvera Street Merchants. Each night the group sings hymns and Christmas songs as they parade through Olvera Street and then they stop at a shop to reenact the request of the holy family for shelter. The "pregrinos" or pilgrims are turned away every night until Christmas Eve, when a designated shopkeeper accepts the group. 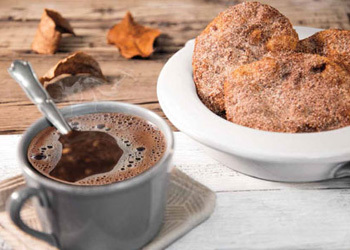 A tasty treat to munch on with your coffee or Champurrado (see October's recipe) is the Buñuelo. This little sweetened fried treat is a staple during the holiday season. Bring brown sugar (piloncillo) and cinnamon to a boil in a pot. Pour in coffee, cover with lid, and turn off heat immediately. Let steep three to five minutes or until all the coffee has settled to the bottom. Strain when pouring into cups. Serve while piping hot. Combine flour salt and shortening in a bowl and mix well with electric mixer. Add warm water slowly until dough is smooth and pliable. Divide dough into 12 small balls and let rest about thirty minutes to one hour in a covered bowl. Sprinkle flour on a smooth surface and roll out until thin. Each one should be about six to 8 inches round. As each Buñuelo is rolled out, fry in sauce pan with hot oil. Turn over when golden brown. Place on paper towel to drain and sprinkle with granulated sugar and cinnamon powder. After all have been fried and dusted. Place on serving dish.